Commodes - Commodes can be used bedside or over the toilet. Choose from standard all in one commodes to bariatric commodes and drop arm commodes that allow easy transfer from a wheelchair. Large selection of commodes online. 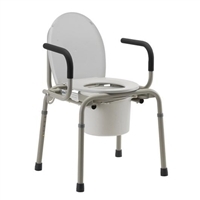 Commodes - Commodes can be used bedside or over the toilet. Choose from standard all in one commodes, bariatric commodes, rolling commodes, commode shower chair combinations and drop arm commodes that allow easy transfer from a wheelchair. Commodes can be used over the toilet to provide the needed elevation for individuals that have difficulty getting on and off the toilet. Our commodes replace the need of a raised toilet seat and toilet safety frame. Large selection of medical commodes online at discount prices. There are many instances where a commode can be useful. Commodes can be used bedside or over the toilet. Bed side- Commodes are used bedside for individuals that are able to get out of bed but may have difficulty making it to the bathroom due to physical limitations, distance to the bathroom or medical reasons. Most commodes are height adjustable so they can be set to the height desired by the person using it. To use the commode bedside there needs to be a commode bucket. The commode bucket should be cleaned early and often to avoid odors and unwanted contamination. Commode liners work well to absorb liquids and help with odor control. When choosing a commode there are some differences between them. Standard All-in-One commodes work well for most people. For people in wheelchairs and those who have difficulty transferring a drop arm commode may be best. Drop arm commodes allow the user or caregiver to lower the arm on the commode to allow transfer to or from a wheelchair or another device. Commodes also vary on size and weight capacity. Determine the weight capacity you need and check the width between the arms. Bariatric Commodes feature an increased size and a larger weight capacity. Over the toilet- Commodes can be used over the toilet. Placing a commode over the toilet does 2 things. 1.) It can act as a raised toilet seat by adjusting the height of the commode over the toilet, making it easier to get on and off the toilet. 2.) It can also work as a toilet safety frame and give the user something to hold on to and assist them in getting on and off the toilet. When using the commode over the toilet you will need a splash guard. The splash guard is essentially a bucket without the bottom.